nero profumo: Goti - Smoke: A Hidden Gem. Goti - Smoke: A Hidden Gem. Goti is an italian brand mainly focused on high-end and avant-garde jewelry using the most unusual materials together with precious metals and gems. Sometime in 2008 they collaborated with Santa Maria Novella's perfumers to start their own line of fragrances and delivered three compositions (Black, Earth and White) that, for the most part, had flown under the radars. Both because they were poorly distributed and not advertised at all. In 2013, they re-designed the packaging, reformulated their previous range (this time working with historical florentine pharmaceutical lab from the 30s, Laboratorio Therapeutico M.R.) and introduced two new perfumes of which Smoke is my personal standout. Now, given the name, if you're expecting a fireplace type of smoky thing, get ready for a disappointment because Smoke is anything but that. Instead, if you're after a radiant and modern incensey thing, you'll have much to love here. Smoke opens with a sour-ish and fizzy accord that makes me literally salivating. On one side there's the red and slightly sweet fruity vibe of pomegranate juxtaposed to the zesty and aromatic quality of the ginger. It feels sparkling, joyful and even light-hearted if you want but never dull. The top notes tame down pretty soon but they keep on lingering throughout the rest of the evolution of the fragrance which is made out of a darker, simple yet pretty impeccably executed crispy incense with woody notes as reinforcement. There's a nose-tingling thing going on throughout that might vaguely remember of gasoline or other kind of combustibles. The woods are smooth and elegant as opposed to the sickening powerful synth-woody notes we often experience in modern masculines and eastern-themed compositions. Overall, I would suggest Smoke to those who like the more incensey Comme Des Garcons or certain fragrances by Olivier Durbano (especially Citrine, Lapis Philosophorum and Heliotrope). It's a modern aesthetic, restrained, quirky and effortlessly elegant. Quick note on the packaging which is simple but very striking in a post-Owens way. The bottle design is pretty much the same for all of their fragrances but you can choose to have your bottle in chrome-finish porcelain (cheaper) or plain metal (much more expensive). Big 100ml bottles come with a leather bulb-pump which is simply stunning. 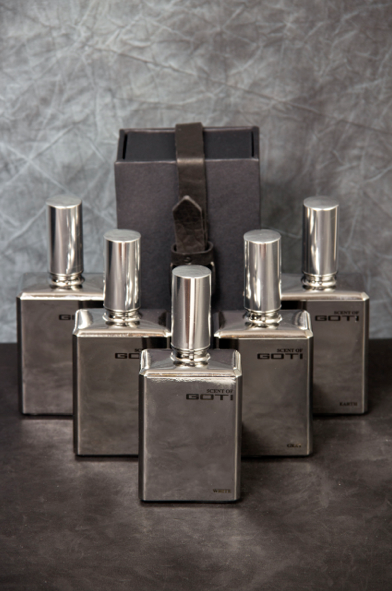 All of the bottles come is a plain black box wrapped in a black leather belt.